A highly energized funk machine, Karl Denson's Tiny Universe has been expanding listeners' minds and making them move to animated grooves since 1998. 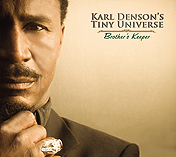 Led by former Lenny Kravitz sax-man Karl Denson, the Tiny Universe brings a dynamic sound that defies categorization. The band members, Denson on vocals, tenor sax, alto sax and flute, guitarist Brian Jordan, bassist Ron Johnson, keyboard player David Veith, trumpet player Chris Littlefield and drummer John Staten, have earned a reputation as kings of the unstoppable all-night show.